Visited legendary Shank Hall in Milwaukee last night with some friends. 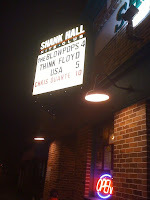 Shank Hall is named after a fake Milwaukee venue from the movie Spinal Tap. The owner booked Tap at another venue in Milwaukee (real, not fictional) and pledged to name a club "Shank Hall" if he ever owned his own. So he did and he did. They have a Stonehenge logo. Brilliant. Seems like a great place to see live music, very relaxed setting. 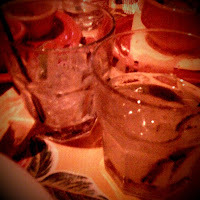 We watched the opening act (someone a few of my friends knew) and from there headed to a nearby excellent Mexican restaurant, Cempazuchi, for dinner and margaritas. A nice evening out.... More photos at my Flickr site.